Falling Striaght-in on an object ball can be a cruel fate for many players. 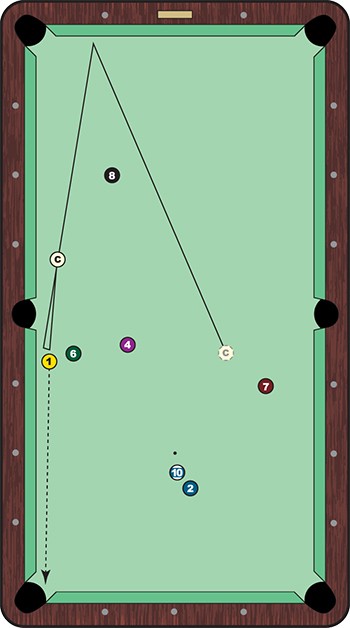 Especially in rotation games, where you're at one location and have a limited number of routes to a desired destination, a straight line from the cue ball through your object ball and into a pocket isn't a friendly sight. If the cue ball were a smidge to the left or right, you'd be golden. Now? Best of luck. Early in the fifth rack of the race-to-13 final of the 2015 Accu-Stats "Make It Happen" 10-Ball Invitational against Shane Van Boening, the 27-year-old was left in the position shown to the right after pocketing a combination with the 1 ball. With the cue ball along the long rail and the 2 ball tucked behind the 10 ball on the foot spot, Shaw didn't have many options. He couldn't roll forward, so he'd have to load up on draw and pull the cue ball back toward him. Playing position from one end of the table to the other isn't always easy, but it's especially tough when you're drawing the cue ball back off the short rail before sending it halfway down the table. Shaw drills the 1 ball directly into the bottom left pocket while the cue ball draws straight back at him. With a little extra sidespin to open the angle to position on the 2, the cue ball rolls down past the side pockets and into position for the 2 ball in the same pocket that swallowed the 1. Shaw cleared this rack, but Van Boening proved too much in the match. Still, since relocating to the U.S. from his native Scotland, Shaw has proved himself capable of competing and beating the best with three consecutive wins at the Joss Northeast Tour's Turning Stone Classic.